There is no excuse not to get a tree stand. Its essential purpose is probably allowing you to return home safely. Without a tree stand, you could fall, get injured, or even experience something worse. With that in mind, you need the best climbing tree stand! 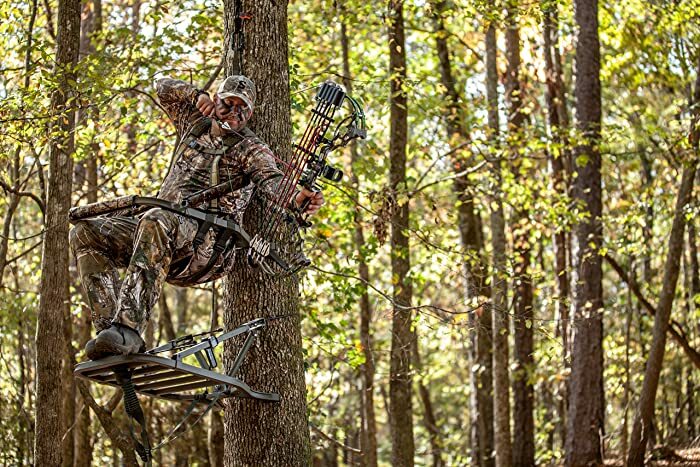 Truly, having a climbing tree stand is a must for every hunter! A hunter’s pack won’t be complete without it. Already want to look for one but don’t know where to start? 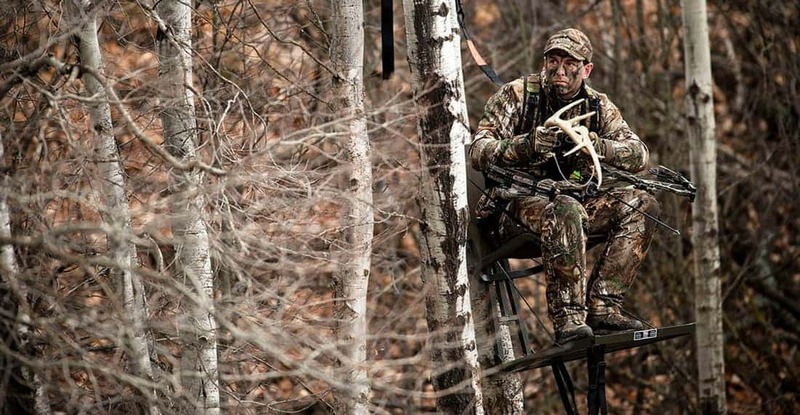 You don’t have to search further as this article features the best climbing tree stands today. So take a look at these five products we’ve ranked. If you are always on the go, you should try Lone Wolf Hand Climber Combo II. It’s a recommended hunting equipment to carry because of its light weight and mobility. At a weight of 17.5 lbs. 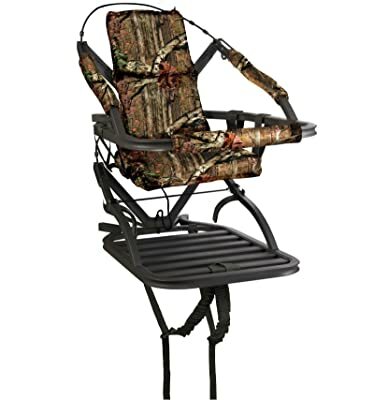 and a maximum capacity of 350 lbs., maybe this tree stand is what you are looking for. 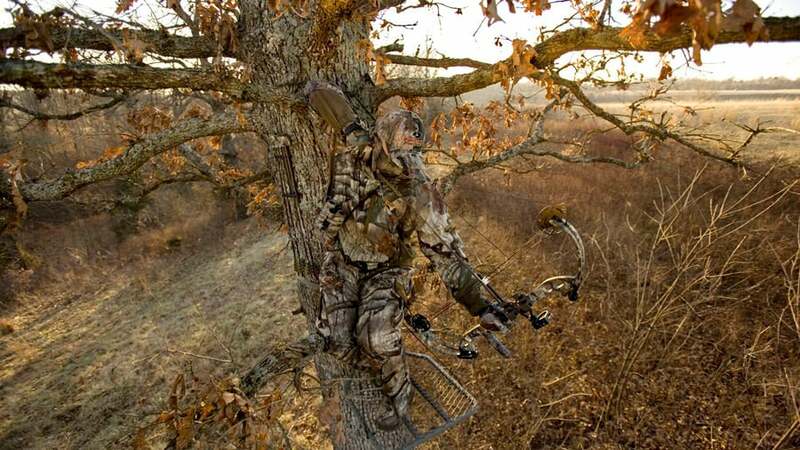 With other tree stand climbers that are more than 20 lbs in weight, it is surely a tiring day for hunters that need to carry those heavy things around their backs and move from tree to tree just to get the perfect spot. This product’s profile is about five inches, and this means that it’s compact enough to stuff in a backpack while carrying other gear for hunting. As for its comfort, the seat is made out of contoured camo foam. 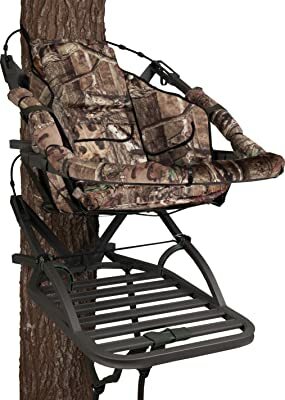 Unlike tree stands that are featured in this article, this one doesn’t maximize the user’s comfort but rather the portability. It’s imminent with the seat design and how it doesn’t have armrests and a full backrest. The platform is measured as 30x19.5 inches and is spacious enough to assume a standing position. The design of the platform is unique with the 3D camo. This allows you to be undetectable by your target and beyond discovery. The tree stand’s platform can provide durability and assure strength because it is made out of one-piece cast aluminum that is not welded. 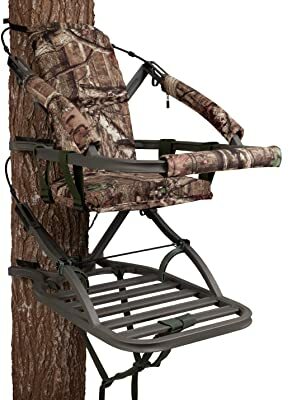 To use the tree stand climber, there are two straps found on the platform that is used as a backpack for easy carrying. The user needs to pick out a good tree that has a diameter of at least six to a maximum of 19 inches, and strap the sturdy polyurethane belt straps around the tree. There’s a bungee strap that you can use to haul your other hunting equipment from the ground without climbing down and up again. With a bow holder equipped, you can put in it parallel-limb bows and other gear. Lone Wolf Hand Climber Combo II has a six-point fall system harness that secures you if there’s an accidental fall because of the suspension relief system. 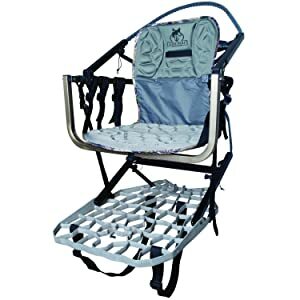 If you want equality between comfort and mobility, you should consider Lone Wolf Wide Sit & Climb as a hunting equipment. It has a four-inch profile that makes it portable and easy to set up when you change trees for a better vantage point. The comfort the seat gives is superb because of the foam sitting area and the backrest too. It measures 21 inches across that can seat a big guy comfortably. The foam panels provide ventilation to many hot hunting trips. The seat is secured with three wide straps that span from one armrest to the other. There’s also a shooting rest that is movable to provide more contact points to the hunter. As for the platform, it is measured to be 30x19.5 inches, and that’s big enough to stand on without fearing of falling. It’s a great feature to any tree stand and adds to that goodness is the 3D camo design that aids the user to blend in without being detected by the target. It is made out of one-piece solid cast aluminum that will not break by the intersections because they are not welded. Aluminum is lightweight, so is the tree stand and only weighs 21 pounds. The tree stand is proved to be quiet when setting it up and when you pack it up. There’s a guarantee from the makers that it will not even make a single sound so that the target would not get a head’s up. For the climbing, pick a tree that is at least six inches and at most 19 inches, then strap the tree stand around it. Don’t worry about the straps, they are unyielding and wouldn’t be easily cut off with a knife, scissors, or any sharp blade. They use belt or cam system for extra safety that is made of polyurethane reinforced with steel cables. 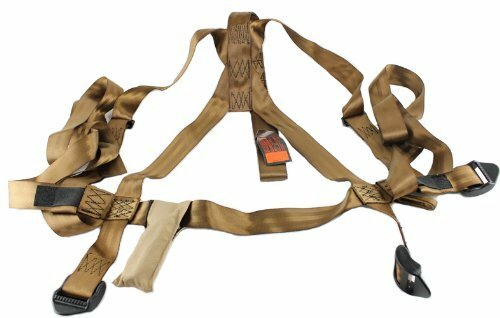 When you get this product, you also get a six-point full body harness system, a bungee strap that allows you to hoist up your gear, bow holder for parallel-limb bows, and two straps that would serve as backpack straps for easy carrying. Another product by Summit that you shouldn’t forget to check out is Titan SD. From its name alone, it can be inferred that it has something to do with big things. In fact, Titan SD caters to the largest of hunters with its superior design that gives comfort and large capacity for the big guys. Its seat dimension of 21.75x28.5 inches, the spacious top section that is extended, comfortable foam armrests, and the platform that makes room for ample leg comfort are few of the many things that would make you excited for Titan SD. Titan SD is a type of tree stand climber that is portable and easy to carry from tree to tree. Because of that, it is made out of high-quality extruded aluminum for the metallic parts and weighs a total of 25 lbs, and can take up much weight of up to 350 pounds. Though it’s heavier than some tree stand climbers, Titan SD makes up for it with its other features and on the plus side, the superior comfort. There’s plenty of room to move about when you get bored from extended hunting hours. Plus, the seat height is adjustable. It’s not only adjustable but can also be buckled or folded to assume a standing position on the platform. The bigger size of the tree stand climber extends to its six-channel aluminum platform that is 21x38 inches. SD stands for Sound Deadening, and it connects to the DeadMetal Sound Deadening Technology that is exclusive for Summit Tree stands. This technology minimizes the unnecessary noise that may be from moving, assembling, and others through the custom-engineered expanding foam that is used to fill in the critical parts. Through this, no more squeaky sounds when you tie it around the tree. Titan SD also has the innovative cable retention system called QuickDraw. Pick a tree that has a diameter of 8 to 20 inches, climb the desired height, insert the cable into the bracket, pull the “trigger” and everything locks into place, firm and secure. The system is foolproof and is quiet, for stealthy moves. Aside from the extruded aluminum that is renowned for its strength and rigidity, Titan SD is further improved with the SummitLokt Technology. This technology locks the joints in place before being welded. The joints’ design also minimizes the stress on the welded areas for the user’s safety. Since climbing is your specialty, Summit also has RapidClimb stirrups that step up the game, so you can firmly place your hunting boots in and move faster to assemble the tree stand climber. Like all other Summit tree stand climbers, Titan SD has four-point harness system that you can always rely on, necessary stuff like pads, ropes, hardware, straps are also included. This product has a Mossy Oak design for camouflage and comes with a warranty. 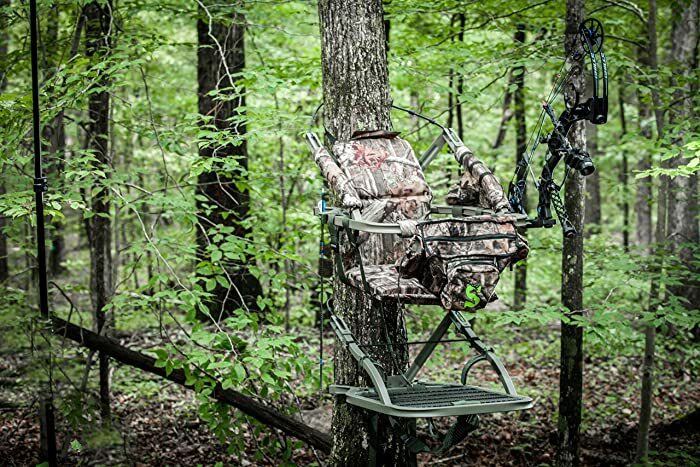 The Viper SD is probably Summit’s most popular tree stand. Survey your preferred hunting terrain up high safely with the Viper SD. There’s more to this portable tree stand than meets the eye. You can expect a reliable tree stand with features that don’t disappoint. Summit has probably mastered the art of quiet engineering with the Viper SD as this tree stand makes you virtually invisible among tree branches and limbs; given you wear the right hunting apparel compatible with the tree stand’s color. Designed with a hunter in mind, the Viper SD boasts a cool combination of camouflage color that seems just nothing for the target; the Combing Mossy Oak color keeps you undetected while taking aim and shooting all the time. Apart from the color the tree stand has, meticulous consideration also occurred in creating the exceptional DeadMetal Sound Deadening SD Technology embedded in the Viper SD. The feature makes it possible to achieve zero noise as the specialty foams fill up the critical parts so you can move on your platform without making a significant noise. Unintentional moves will produce no sound at all. You’ll also like how the QuickDraw Cable retention system, a technology that exists only in this brand, provides a quick and silent cable attachment system that is quite easy to optimize. No need to immerse yourself with tricky bolts & nuts or pins & knobs with this system. Being an effective concealer and silent are not the only things the Viper SD could boast. You’ll also be in awe on how this thing could make you comfortable. You have a foam seat and a backrest that keep you relaxed in place when observing the terrain. 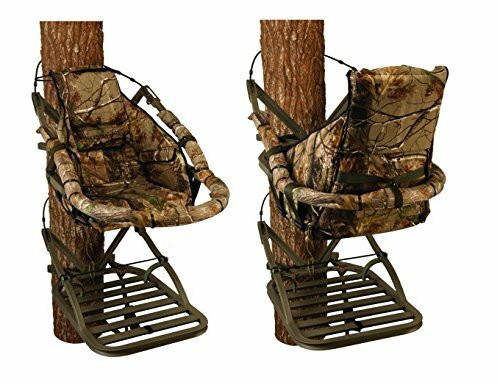 The tree stand can accommodate any boot size thanks to the climbing stirrups that are ergonomically shaped. 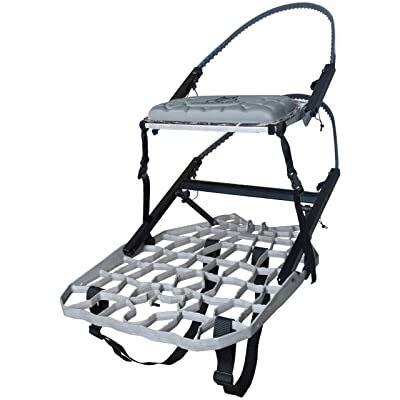 Effortless ascend and descend movement is also made possible by the four-point safety harness. Precision welding and robust, extruded aluminum make sure you get the safety you deserve. The tree stand is designed in such a way minimal stress is delivered into the tree stand through locking every joint in place before welding the. As a result, you got a tough, secure tree that's deadly quiet when in action. Overall, the Viper SD is an ideal fusion of space, comfort, versatility, and light weight that work together to make your hunting trip productive, exciting, and extremely safe at the same time. Worry less when shooting at an elevated height especially on a tree with this product. This one guarantees extreme comfort no matter what kind of body type you have. It’s more to the benefit of the larger hunters because of the foam seat with full backrest accompanied with foam armrests. Its seat size is 18x12 inches that surely gives you comfortable sitting for long hours. This product’s main feature is its reversible foam seat that can be rotated up to 180 degrees. In that case, you can face the tree or away from it. It allows you more vantage point because you can hide behind the tree for your prey stalks. The platform is also gigantic at a measurement of 21x38 inches, the largest among the tree stands of Summit. Though this tree stand climber is large, its weight is just 26 pounds. The platform is, in fact, perfect for big hunters because of the ample legroom. 180 Max SD is equipped with DeadMetal Sound Deadening Technology that has its function already laid out, given its name. It dumbs down the unintentional noise by filling in the critical parts of the tree stand climber with expanding foam that is carefully engineered. This is advantageous for stealthy hunts and stakeouts. As for the strength of this tree stand, it has a maximum weight of 350 lbs. The metal parts of the tree stand climber are made out of high-quality extruded aluminum with SummitLokt Technology that assures the user with absolute rigidity and maximum strength because every joint is locked firmly before it is welded. This results to the tree stand climber taking much weight because the stress is minimized due to the design. Your safety is guaranteed in using 180 Max SD with its QuickDraw cable retention system that is the fastest and most silent innovative cable attachment system made as of date. Insert the cable into the bracket and then fit the cable to the tree’s diameter (ranging from 8-20 inches), next, pull the “trigger,” so the cable is firmly secured. With this system, there will be no need for knobs, bolts, and whatnot. This tree stand climber is also equipped with RapidClimb Stirrups that can fit any boot and allows you to climb fast. Safety is Summit’s #1 priority, and when you buy this product, it comes with full-body safety harness with suspension relief system and carrying straps. 180 Max SD comes in one design: Mossy Oak and has a 5-year warranty. Safety or injury? Choose one. If you select the former, which you should, then the next step is to purchase your very own tree stand! With a vast array of options today from different brands and manufacturers, it’s hard to come up with the right one. I hope this article has helped you determine your very first (or second, for that matter) tree stand that will serve as your safety companion the next time you go hunting. The best climbing tree stand is something that could provide you complete security and at the same time offers the comfort you deserve.